The highest compliment that I have ever been paid was to read Los Angeles Magazine and have my work described as “spirit calming to the patients at UCLA”. Additionally, the Department of Spiritual Care at UCLA wrote that my work used in conjunction with the healing of patients “captures a deep sacredness and intimacy that brings a spiritual dimension to our environment”. Jill Sattler is a painter and photo dramatist in Santa Barbara, California. She is an honor graduate of Chouinard Art Institute in Los Angeles (currently CAL ARTS in Valencia). She has exhibited at the Carnegie Art Museum, Contemporary Arts Forum of Santa Barbara (currently Museum of Contemporary Art), Art Museum of Santa Cruz County, Oceanside Museum, Karpeles Manuscript Museum, Ojai Valley Museum, Carl Schlosberg Fine Art Los Angeles and New York, Garth Clark New York, UCLA, Ridley Tree Museum of Art Santa Barbara and Museum of Fine Arts, Houston. Jill Sattler has had the privilege to photograph the internationally acclaimed ceramicist Beatrice Wood, Chantal of “Good Morning America” and her dog Mollie, actresses Sandy Duncan, Betty White, as well as Susan and Jeff Bridges, Christopher Reeve, and Santa Barbara writers Jane and Robert Easton. 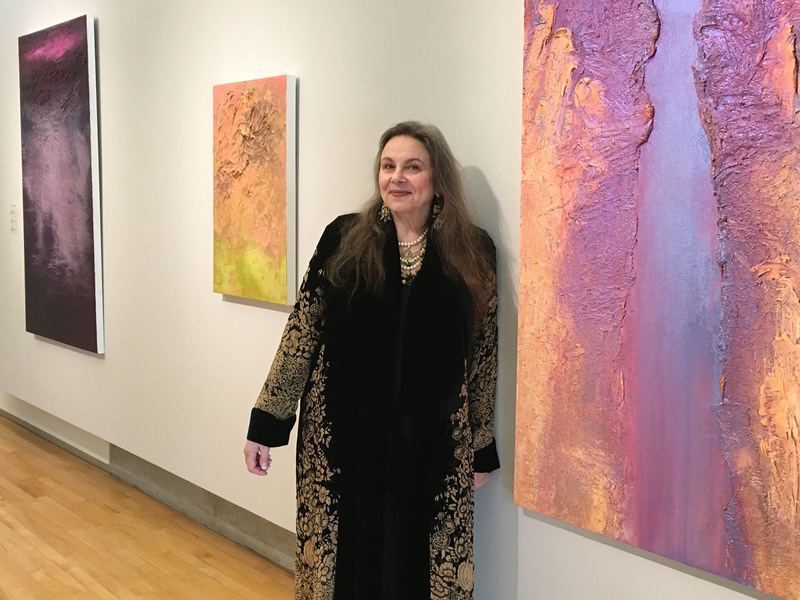 Jill’s works of art have been exhibited in conjunction with works by Beatrice Wood, Edward Curtis, Ansel Adams, and Timothy O’Sullivan, Kandinsky, Whistler, Lichtenstein, Matisse, Picasso, de Kooning, Diebenkorn, Toulouse-Lautrec as well as Giacometti, Sam Francis, Ed Kienholz, and David Hockney. Jill gained notoriety in the field of jewelry design when her earrings were worn by Cher as the actress accepted an Academy Award for her work in “Moonstruck.” Diane English, writer/executive producer of the television show “Murphy Brown” was featured in Elle Magazine wearing necklaces designed by Jill. In addition, Vanity Fair, Ladies’ Home Journal, Memories Magazine (front cover), Los Angeles Magazine, Santa Barbara Magazine, Montecito Magazine, SB SEASONS Magazine, Style 1900 Magazine, as well as the Los Angeles Times and other publications, also displayed her work. Jill was also featured on HGTV. Jill has the honor of having more than 100 of her works of art in the permanent collection at UCLA Medical Arts Center in Los Angeles, the permanent collection of Museum of Fine Arts Houston, Beatrice Wood Center for the Arts in Ojai, Francis M. Naumann collection in New York, and the Lotusland private collection in Montecito.